The Balloon Track was historically used as a railroad switching, maintenance and freight yard from the late 1800s until the closure of the rail lines in the mid 1980s. 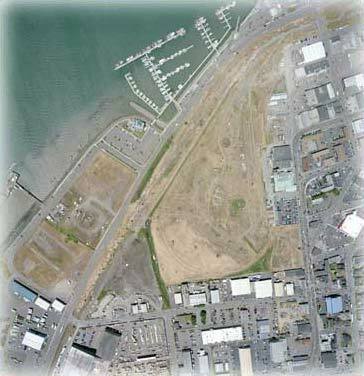 The site, classified as an urban brownfield by the United States Environmental Protection Agency, remained vacant, blighted and degraded, and under the ownership of Union Pacific Railroad. After years of pursuing a sale, Union Pacific Railroad did not find an appropriate buyer until Security National Properties expressed interest. Security National Properties purchased the property in September 2006 as the first step in achieving its vision for the proposed mixed-use development of Marina Center. An integral component of the plan is to restore and protect nearly a third of the total property area as a coastal wetlands preserve, rehabilitating the parcel to a historic environmental condition that is has not seen for more than 100 years.